Rudi Fronk and Jim Anthony, co-founders of Seabridge Gold, explore what’s next for the stock market and how that will affect gold. First and foremost, valuations are too high. Third-quarter results have been disappointing. Investors are realizing that sales and earnings cannot grow fast enough to keep the market at record valuations. Second, the stock market is telling us that its advance has been too narrow. . .too dependent upon a handful of stocks driven higher by the herding effect of passive ETF and index investing where the winners win more because they are winners, boosted by their celebrity status than fundamentals. These market leaders have now been rounded up and summarily shot. Third, Fed tightening has taken the steam out of speculation. 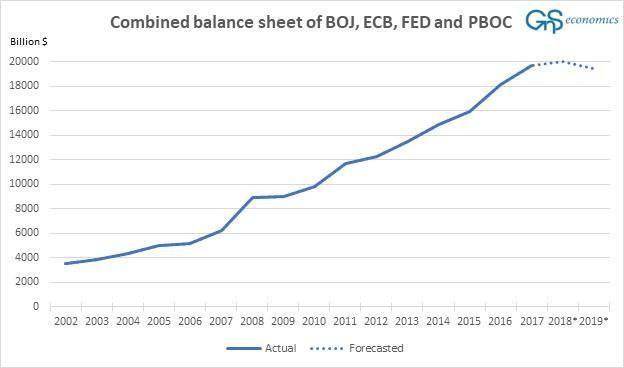 The Fed's QE-driven liquidity bonanza, aided and abetted by the European Central Bank, Japanese Central Bank and People's Bank of China, drove the stock market higher without any appreciable long-term gains in real economic growth. Now that the excess liquidity is being withdrawn, why would we be surprised that the stock market has begun to struggle? Fed rate hikes and asset sales combined with a surge in Treasury new issuance have turned off the speculative jet fuel spigots. Fourth, the immense debt loads that caused the 2008 financial crisis are now much higher relative to the real economy. 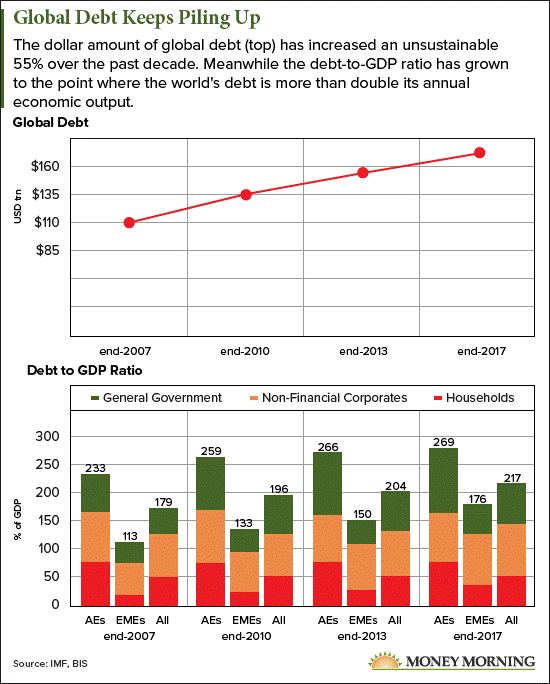 In its most recent report, the Bank of International Settlements points out that global debt of all kinds—government, corporate and household—has risen from about $110 trillion in 2007 to over $170 trillion as of the end of 2017. That's a 55% increase in the decade since the 2008 financial crisis. Meanwhile, the global debt-to-GDP (gross domestic product) ratio has also climbed to dangerous levels, rising from 179% in 2007 to 217%. That means the world's outstanding debt is more than double its annual economic output. Years of low to negative interest rates have weakened corporate balance sheets and reduced hundreds of formerly great companies like GE and IBM to zombie status, unable to withstand higher interest rates and manage their debt burdens. Fed policies have encouraged companies to misallocate capital on a grand scale, and now the bills are coming due. Credit risk is beginning to matter once again, after years of absence. Finally, as stocks have been hammered lower, bonds have not responded by a strong move higher. We agree with Jeffrey Gundlach, the Doubleline bond king: the stock market is signalling an economic slowdown but the bond market is indicating the coming slowdown is likely to be inflationary, not deflationary. Will the stock market make a smooth transition from momentum speculation in high tech growth to slow and steady value investing based on fundamentals? Maybe, but not easily or quickly and not without a tour of much lower price levels in the major indices. In short, we think the stock market fever has broken and we are headed into a bear market. Perhaps you don't agree, but even if you are not in agreement, you must consider this as an important risk. What does this risk mean for gold? We are convinced that the Fed is going to change its monetary policy in the next several months. They know that their policies created the current stock market bubble and while they may want to see the bubble diminished, they do not want to be held accountable for a market collapse. We think they will pause rate hikes early next year and possibly also halt or reduce their asset sales. The result will be transformative for the gold market, which has priced in Fed tightening through next year. A shift in Fed thinking is already evident. In mid-September, as the stock market reached for new highs, Fed speakers hawkishly began floating the possibility that the Federal Open Market Committee's (FOMC) short-term neutral rate might exceed its long term neutral rate, which is currently at 3% in the dot plots. On Sept. 12, in a speech entitled "What Do We Mean by Neutral?," Fed governor Lael Brainard said: "It appears reasonable to expect the shorter-run neutral rate to rise somewhat higher than the longer-run neutral rate. These developments raise the prospect that, at some point, the Committee's setting of the federal funds rate will exceed current estimates of the longer-run federal funds rate." Fed Chair Jerome Powell said the same in his Sept. 26 remarks after the last FOMC meeting, noting: "Maybe we'll be raising our estimate of the neutral rate and we'll just go to that, or maybe we'll keep our neutral rate here and then go one-or-two rate increases beyond that." Why would Fed Governors suddenly propose temporarily hiking rates above long-term targets so painstakingly established in prior dot plots? Clearly, the Fed was responding aggressively to rising stock market valuations which were ignoring Fed tightening. On Oct. 3, in an interview with PBS's Judy Woodruff, Powell said: "Interest rates are still accommodative, but we're gradually moving to a place where they will be neutral. We may go past neutral, but we're a long way from neutral at this point, probably." His greatest concern was to stop the economy from overheating. In his Oct. 25 speech in Zurich, Powell was still hawkish, noting that Fed policy normalization is "likely to break a few things along the way." He was right. . .the stock market was breaking and the story quickly changed. The Federal Reserve's new Vice Chairman Richard Clarida was interviewed on Nov. 16 on CNBC. Clarida stated that nearly three years of increases had brought the Fed's short-term interest rate near where it is neither restrictive nor stimulative, a key consideration when considering the future path of monetary policy. "As you move in the range of policy that by some estimates is close to neutral, then with the economy doing well it's appropriate to sort of shift the emphasis toward being more data dependent." That's very different from Powell's statements just a few weeks earlier. Clarida was actually the second central banker in as many days to suggest neutral isn't far away. On Nov. 15, Atlanta Fed President Raphael Bostic said: "I don't think we are too far from a neutral policy and neutral is where we want to be." In prepared remarks for a speech in Madrid, Bostic stated: "We may not be there quite yet, but I am inclined to think that a tentative approach as we proceed would be appropriate." Bostic specifically expressed concerns about a slowdown in global growth and fading fiscal stimulus in the US. We suggest that investors should position themselves for a major shift in Fed monetary policy sooner than later. That positioning should, in our view, include gold and gold stocks. If we are right, the stock market should also rally, but not so much if an economic slowdown is on its way. This article is the collaboration of Rudi Fronk and Jim Anthony, cofounders of Seabridge Gold, and reflects the thinking that has helped make them successful gold investors. Rudi is the current Chairman and CEO of Seabridge and Jim is one of its largest shareholders. Disclaimer: The authors are not registered or accredited as investment advisors. Information contained herein has been obtained from sources believed reliable but is not necessarily complete and accuracy is not guaranteed. Any securities mentioned on this site are not to be construed as investment or trading recommendations specifically for you. You must consult your own advisor for investment or trading advice. This article is for informational purposes only. Charts provided by the authors.